Clement Clarke Moore was a professor at Columbia College now known as Columbia University. Mr. Moore published "A Visit from St. Nicholas" anonymously in 1823. It was reprinted many more times without credit until he later acknowledged that we was the author of the poem. He had written the poem for his children and they insisted that he claim authorship. 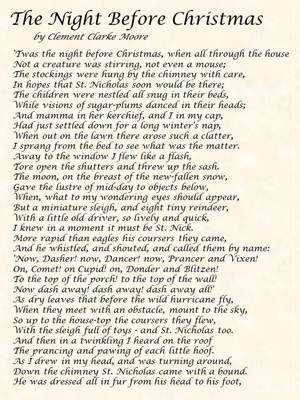 The poem has come to be known as "Twas the Night Before Christmas" after the first line. A playground was opened in his honor in New York city in 1968. Even today, residents of the neighborhood gather at the park on the last Sunday of Advent to share a reading of "Twas the Night Before Christmas".